Hello dear friends from the English spoken blogger world! First of all I wish all a great year ahead full of creativeness , joy and lots of health for yourselves and for the ones that you love! 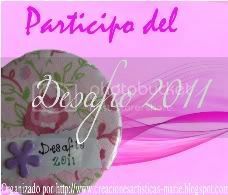 It is called “Desafio 2011” english>>> “Challenge 2011” The aim of this challenge is to make 20 (craft…any sort of craft ) projetcs in 11 months!! that means we will be starting on February and putting your names up in january (during all this month) >>> Correction MARCH!!!! Every month I will be posting a “special post” called “Desafio 2011″…where you will have the chance to paste your link to your “projects for the month” . The post to share your challenge should be called as follows ” Challenge 1/20 – Month 1″ I am pretty sure you won’t have a problem !! You all are so creative!!! The idea of pasting your links to one post will give everyone the chance to have a look around and see what the rest of the crafties have been up to. It would be fantastic if you can invite more crafties to be part of this iniciative! Thanks guys for comming and reading this , any questions ??? have a great week ahead and a fantastic creative mood! Hi Marie! I just read your comment on my blog and I’d love to join in:) I actually have a project that I’m starting today so I will link up to you when I’m finished. It should be done by tomorrow. Thank you so much for your kind comments, it makes me feel good to know that people enjoy my posts:) Hugs my friend! P.S. I added myself as a follower to your blog, it’s the fuzzy grey icon (supposed to be cherubs!). Tu chiflas y yo bailo amiguita! Claro que le entro, me llevo el logo y la propuesta! Gracias por tus lindas palabras y Millones de gracias por pensar en mi! Passei para conhecer seu blog… amei mesmo!!! Hay que ponerse en modo creativo!!! Voy a pensar que puedo hacer. I’m really enjoying the theme/design of your web site. Do you ever run into any internet browser compatibility problems? A handful of my blog audience have complained about my website not working correctly in Explorer but looks great in Chrome. Do you have any suggestions to help fix this problem?